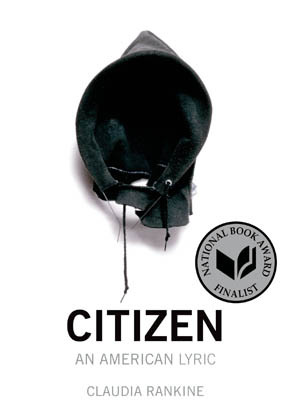 Citizen: An American Lyric by Claudia Rankine. Graywolf Press, 160 pp. I thought of Mike reading Citizen: An American Lyric, Claudia Rankine’s short book, a long segmented essay-poem, on her experience as a person of color making her way in realms still mostly white. Citizen, Winner of the National Book Critics Circle Award in Poetry, proves that great literature doesn’t have to be hard reading. Except, in this case, emotionally. Rankine challenges white readers as she conveys the cognitive dissonance she lives with as an African American. For example, when her white friends slip and reveal their unconscious prejudice toward her or another member of her race. Or when she witnesses the barriers faced by tennis star Serena Williams. Or when she hears of a black person harmed by cops. Consider, when even people with white skin feel wary in dealings with police, what a cruiser’s appearance must feel like to black people. In this politicized moment, I couldn’t help but think, as well, of America’s public schools, which get attacked but remain crucial in fostering a happier diversity. If a person of color makes it to the corporate ladder, executives try to ensure her or his climb, realizing as a matter of common-sense policy that everyone who excels should get a shot at middle- or upper-middle-class success. Given that, I cannot understand many Republicans’ consistent antipathy toward public schools. On the one hand, they steadily undermine public schools, minorities’ proven path to success; on the other hand, many business leaders, probably mostly Republicans, reach out a hand to those few who somehow claw their way inside America’s skyscrapers. Rankine has white friends, among them some who’ve trespassed, but is at the cutting edge herself—still—of the racial integration of America’s mainstream. Rankine knows the lie of racism and the truth of community. She knows the falsehood of superficial differences and the strength of diversity. She shows this in Citizen: An American Lyric through her experiences. Rankine’s uneasy emotional reality is conveyed by a wise, wry, and stoic persona. That’s quite an accomplishment in the face of human idiocy and structural injustice. Thank you for this review. You make me want to read the book. Thank you also for sharing your own stories. And for remembering Mike. I hope he reads this post and recognizes the impact he had on you. The next stage of racial reconciliation must involve us white folks taking more responsibility for our own transformation and owning our part in the social structures that continue to replicate inequality. Well said, Shirley. I hope your realization is widely shared. One wouldn’t know it from the current backlash, but I think most want to do the right thing. .Good post, Richard. The only fault I find with it is that it’s shorter than your usual! Seriously, though, I think you’ve devoted a lot of thought to this. I just wish we didn’t have people like Donald Trump around, motivating the worst in people who themselves as well are not very sterling. Kind of you, Victoria. I think and hope buffoons like Trump will, in the end, help everyone clarify values as individuals and Americans. My faith is that we’re moving forward, so I try not to get too upset by small blips. Hasn’t always worked this year!